I wanted to make a piece that reminds me of the beautiful sunflower giants that grow in my yard each summer. 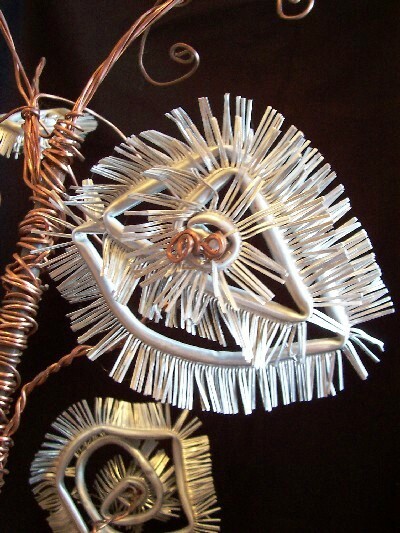 Using found materials from an old refrigerator, I was inspired to create this sculpture. The heavy headed flowers are suspended on sturdy stalks that move and sway in the wind. This art piece also catches vibrations of people walking by if placed in an indoor setting. This movement is a critical part of this piece, illustrating the dynamics of life in all things growing. Each time I look at this work I am reminded of the simple joys of nature and how it is able to feed my soul. 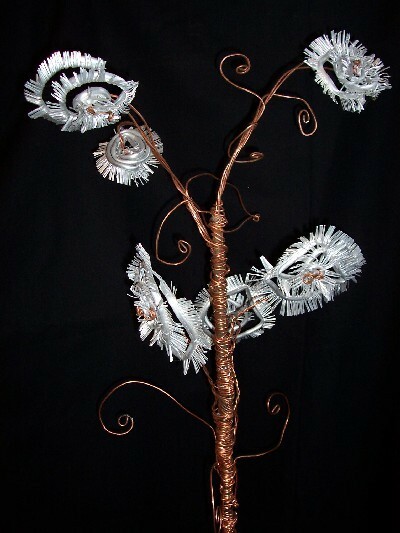 Materials Used: Copper wire, aluminum cooling tube, antique lamp base. Dimensions: 18 inches width x 18 inches depth x 66 inches height; Weight: 30 lbs.